The Marine Mammal Center : Honey Girl the Hawaiian Monk Seal has a Baby! Honey Girl the Hawaiian Monk Seal has a Baby! Honey Girl and her newborn pup. Honey Girl is a mommy again! On February 25, she gave birth a pup on the North Shore of Oahu. It was the first known Hawaiian monk seal pup to be born in 2015 in the main Hawaiian islands. This is becoming a regular pattern with her now. Wildlife officials from NOAA have just determined the pup is a female, although so far she is only known by her tag number P01. This is Honey Girl's ninth pup, a clear indication that she has recovered nicely from the surgery that removed a fishing hook from her cheek in 2012. It's always gratifying to see our former patients doing well. Honey Girl and her baby rest on the beach. Say “hello” to Honey Girl’s new pup, the first Hawaiian monk seal born in 2014. Honey Girl (also known as R5AY by the flipper tag researchers attached to her when she was young) was rescued in critical condition just 13 months ago with a fishing hook lodged in her cheek. After a delicate surgical procedure and 13 days of rehabilitative care under the direction of The Marine Mammal Center staff and other collaborative partners, Honey Girl was returned to the wild where she has since thrived. The researchers monitoring Honey Girl know that she has given birth to six pups over the years, and this year she returned to her usual spot at Turtle Bay on the island of Oahu to bring her newest pup into the world. She’s been a great mom so far, nursing and tending to her new pup, and her previous pup has been staying close by as well. Honey Girl is expected to nurse for about eight weeks, during which time the pup will double or triple in weight. We’ll continue to monitor Honey Girl and her young one, as every pup is important for the continued survival of this critically endangered species. Read the dramatic story of Honey Girl's rescue, rehabilitation, and release in 2012! Read about the new hospital we've opened dedicated to helping Hawaiian monk seals! 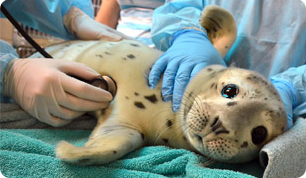 Adopt a former seal patient through our Adopt-a-Seal gift program and help future patients like Honey Girl!